B-Fest Teen Book Festival, here we come! Workshop- presented by YA authors Marlo Berliner (The Ghost Chronicles) and Brynn Chapman (Boneseeker and The Requiem Red). This event is a must for any teen who dares call themselves an avid reader or fan of YA! Marlo and Brynn will discuss how teens can discover the hottest new young adult books, receive content tailored specifically to their preferences, access exclusive excerpts and giveaways, and connect with their favorite authors online in a variety of new and exciting ways. Marlo and Brynn will also discuss how teens can begin writing and sharing their own fan fiction, flash fiction, poetry and short stories. The door to the publishing world is more open to teens than ever before, Marlo and Brynn will be here to help lead them through it! Brynn and I are so excited to speak with teens about something we are very passionate about – encouraging reading, writing and literacy among young adults. 7:00 PM Friday, June 10th Barnes and Noble in Bridgewater, NJ. 1:00 PM Saturday, June 11th Barnes and Noble in Hamilton, NJ. 11:00 – 2:00 PM Sunday, June 12th Barnes and Noble in Freehold, NJ. This is going to be the biggest weekend of author events in Barnes & Noble history, including not just signings but trivia, exciting sweepstakes, giveaways (while supplies last), and more. Be the first to sample upcoming teen novels, take part in games, and discover great new reads. 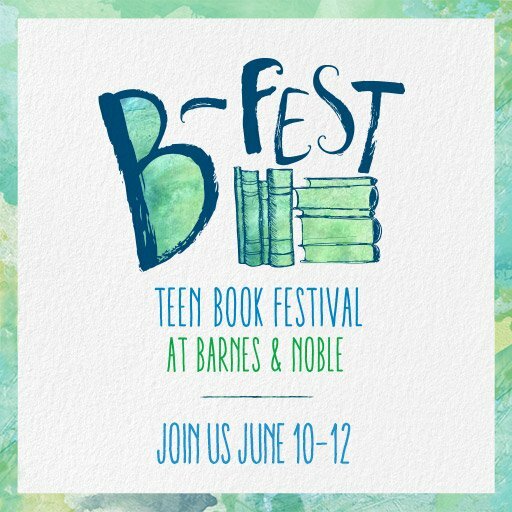 Follow along with the fun at #BFestBuzz! More information about the nationwide event can be found here: Barnes & Noble B-Fest. Also, if you are a YA book blogger and would like to be on the list of YA blogs on our workshop handout, please send me an email at marloberliner@gmail.com by June 6th and we’d be more than happy to include your blog on the handout! Again, our goal is to direct teens to where they can find the best information about new and upcoming YA books. What better way to do that than to spread awareness of all the fantastic YA book blogs out there! This entry was posted in Uncategorized and tagged #bfestbuzz, #yabookbloggers, B-Fest, Barnes&Noble, books, booksigning, Brynn Chapman, Marlo Berliner, Requiem Red, teens, The Ghost Chronicles, young adult by marlo. Bookmark the permalink.